"Special editions" of Adobe's consumer-oriented editing software, Photoshop Elements 10 and Premiere Elements 10, are now available to purchase on Apple's Mac App Store. Both Adobe Photoshop Elements 10 Editor and Adobe Premiere Elements 10 Editor are available on the Mac App Store for $79.99 each. The "Editor" portion of the name reflects the fact that the Mac App Store versions of the software do not include the Elements Organizer or support case-sensitive HFS volumes, while Premiere Elements 10 Editor also lacks Smartsound capability. The release of "special editions" of Adobe's consumer photo and video editing software comes less than two months after they were released at retail. The full version of both Photoshop Elements 10 and Premiere Elements 10 come at a higher suggested price of $99.99 each. Adobe originally debuted on the Mac App Store in July with the release of Photoshop Elements 9 Editor. Adobe's support of the Mac App Store is noteworthy, as many of Apple's competitors have chosen to avoid the digital distribution storefront, which gives Apple a 30 percent cut of sales. Adobe is pitching its Mac App Store version of Photoshop Elements 10 as a product that "works great with iPhoto when you're ready to go beyond the basics." The $79.99 purchase includes all of the editing features of the full version, and can be installed in English, German, French and Japanese. Go from flawed to phenomenal in seconds with automated options that help you get great results with just a few clicks. Simply paint effects and patterns on photos to achieve stunning results. Count on step-by-step assistanceLet Guided Edits help you achieve both basic edits and artistic effects by walking you through each step. New options help you create dramatic Depth of Field, Picture Stack and Orton effects. Make unwanted photo elements vanish with one stroke of the enhanced Spot Healing Brush that fills in backgrounds beautifully, powered by the content-aware fill technology from Adobe Photoshop. 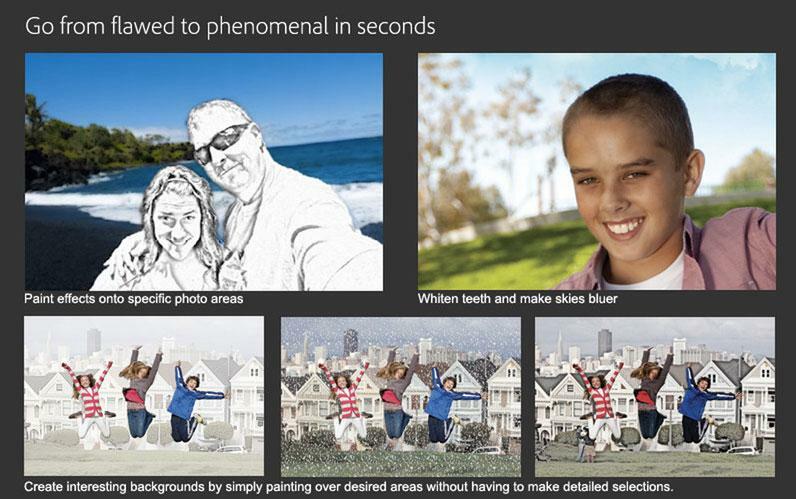 Create the perfect photo by easily combining the best from multiple photos. Create great group shots, expanded panoramas, perfectly lit shots, and more. Share the way you want using flexible templates to create photo books, cards, calendars, and more. Add curvy, flowing text that automatically flows around subjects, shapes or any path you choose. Create a polished movie instantlyInstantMovie automatically edits together your best clips with coordinated music, titles, and effects from your choice of movie theme. Enjoy over 30 fun themes. Save time with automated optionsFix shaky footage, color and lighting problems, trim away all but your best footage, and balance audio elements to give you professional-quality sound throughout your movie. Easily do more with video clips and photosMake all your memories shine whether theyre captured on video or in photos. Enhance color in video clips as easily as with photos, and quickly bring photos to life using customized pan and zoom motions. Quickly add professional polish with TV-style visual and audio effects. 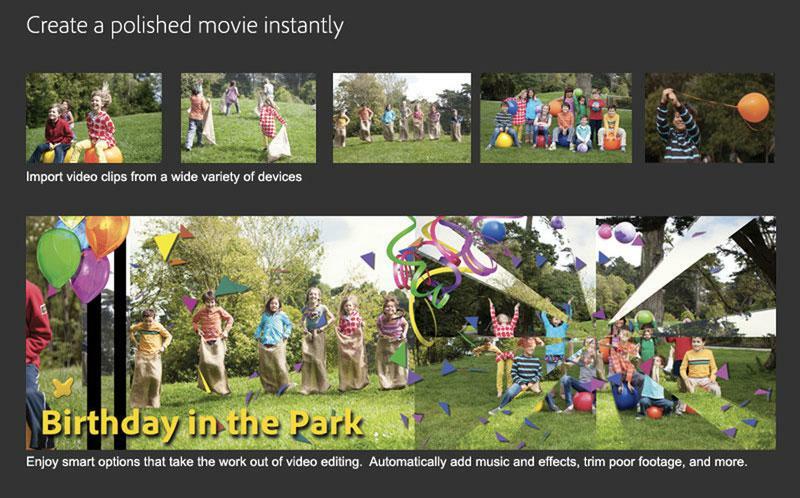 Showcase clips and movies anywhere, including on discs, HD TVs, Facebook and YouTube. Also share via convenient DVD-style viewing experience online.